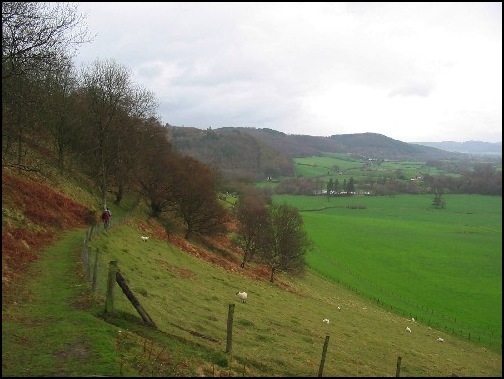 Having decided that we should have a walk during the Easter period, Larry and Peter came up with the idea of a ”pleasant stroll” on the English-Welsh Border along Offa’s Dyke from Gladestry, initially going over Hergest Ridge to Kington, and then continuing northwards along the Dyke to Evenjobb. I was really looking forward to it, but having not heard anything from any of the “Boys” for a couple of weeks I was unsure if it was still going to happen. Although initially forecasts looked as if the weather would be good for the walk i.e. 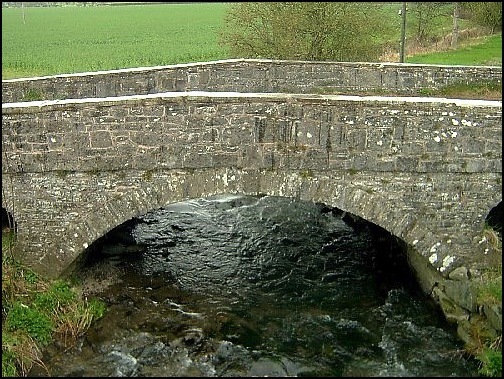 no rain, as the day approached it would seem that on the 12th along the Welsh Borders and in the Midlands it was going to be wet – very wet. So I was almost hopeful that the walk was no longer going to happen. And then first thing on Tuesday, 24 hours before the intended hike, I received an email from Peter checking if the walk was “still on” for the following day. About 30 minutes later the telephone went. It was Larry and although he had not been very well – “touch of flu” - he was game for the walk. As Anne had answered the telephone she told him I was looking for an excuse not to get wet. I therefore would never have lived it down and would really have become a “Fairweather Walker” if I didn’t take up the challenge. 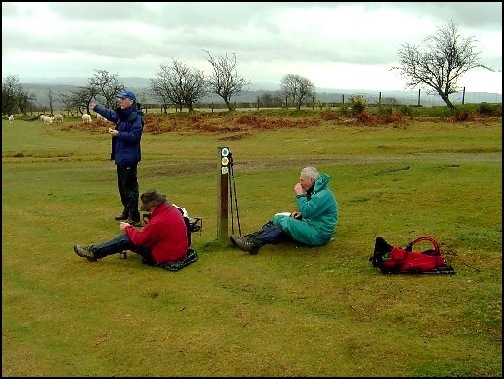 So 8.15 the following morning saw me sat alongside Mick – Larry was in Peter’s car as Peter was driving down to Cardiff after the walk – heading west towards the Welsh Border and precipitation. 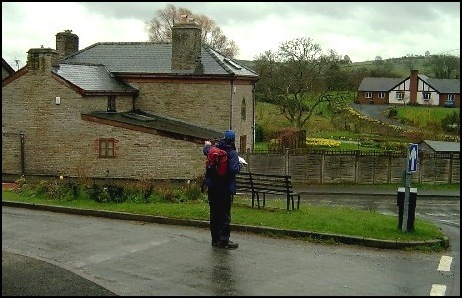 Initially the weather was kind as we sped along admiring the daffodils that were in abundance on the side of the road, but by the time we reached Kington we had already seen a fair amount of rain. In Gladestry in the rain, with Larry indicating the way to go. Having parked Mick’s car in a lay-by at Evenjobb we all got into Peter’s Car to travel the 6 miles or so to Gladestry where a “local” directed us to a very good parking place outside the Village Hall; and shortly afterwards, at about 11 o’clock, we were striding out, protected in wet weather gear, along the main village street – which is also a part of Offa’s Dyke footpath – to reach the base of the first climb of the day onto Hergest Ridge. 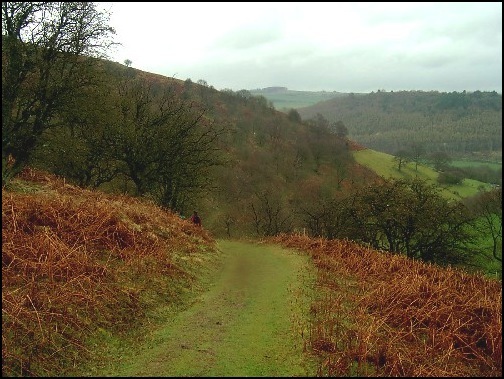 Having turned right, off the road, we headed up a steep lane before turning left off it and continued to follow the Offa’s Dyke Path through the rain towards the top of Hergest Ridge. Once on the top it was certainly pleasant walking over the springy turf and even the rain could not spoil the beauty of this area, although taking photographs was not easy and, with the rain coming from the south west, it was inevitable that during this stretch of the walk the views to the north and west were most photographed. Keeping the rain off a camera lens can sometimes be a real problem. 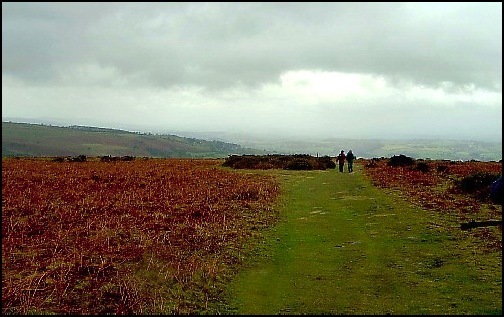 Nearing the top of Hergest Ridge - the first ascent of the day. A good sign to show us the way. Lovely scenery - just a pity about the weather. Just after noon, almost exactly an hour into the walk, as we started to descend, the rain subdued a little and we took the opportunity to sit down and have a drink and a bite to eat. Not the most pleasant of picnics but still very enjoyable. Was the weather getting better? 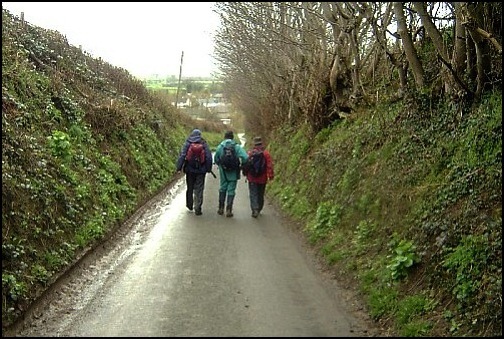 For a while the answer was yes as we strolled off the ridge and then along the road into Kington. 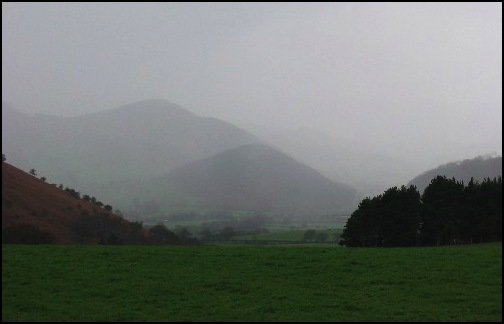 A wet Kington - Can anyone see a sign for Offa's Dyke? So often on walks the most difficult part of navigating is finding the start of the route from a built up area or, in the case of today’s walk, when you reach a built up area and the path signs vanish. And this is what happened in Kington. But it was very interesting. After Peter and Larry had made some purchases in a local shop we allowed Larry to guide us out of the town, and we went the wrong way. 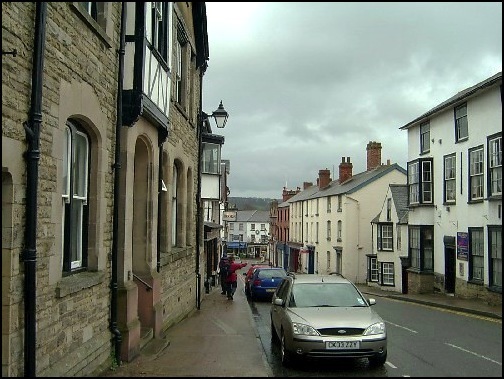 So Peter took over and took us on a tour of some of the pleasant little alleyways of the town, which would have put us on the correct route if we had wanted the Mortimer Trail, another local walking route. 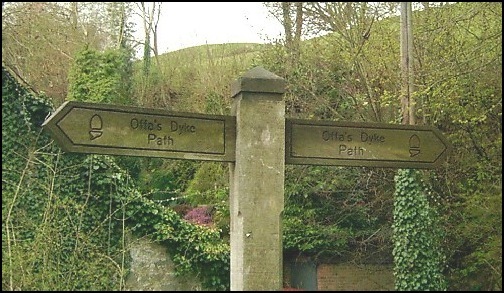 This Offa’s Dyke Path certainly seemed elusive so I asked a couple of local ladies the way. 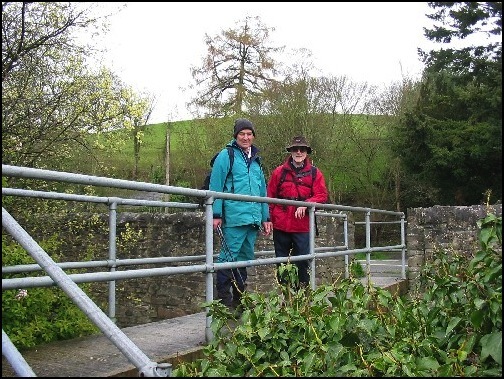 We were directed through more alleyways and backwaters until we finally found an Offa’s Dyke Sign, followed it and, having crossed a the main road (A44) ,it was uphill once more. An elusive Offa's Dyke Path sign. Almost at the top of this second ascent of the day I was surprised to see we crossed the eastern edge of a Golf Club - Kington Golf Club at Bradnor Green. It certainly seemed a very elevated and windy location for such a facility. Needless to say today no one was spied hitting or even considering hitting a golf ball. 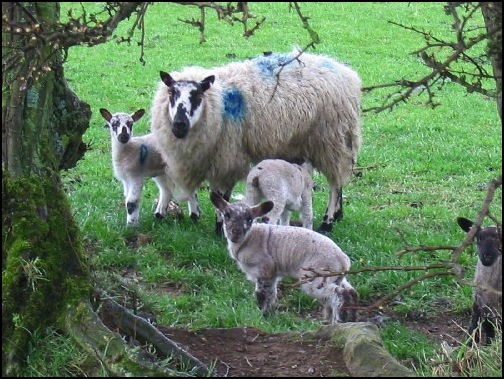 A Larry picture of some of the sheep near Rushock Hill. 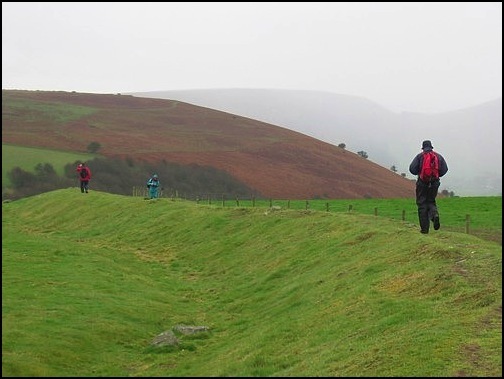 Our route continued along a reasonably well signposted northwards track over sheep fields until we did a sharp left turn on Rushock Hill and headed westwards and saw evidence of Offa’s Dyke for the very first time - there was a very obvious embankment “running” alongside our path. 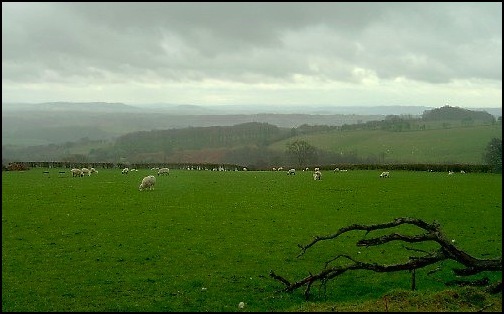 As we continued westwards, although the weather was still making the views very “grey”, I was able to take some photographs looking towards Wales before the heavens opened and my camera was quickly hidden from the elements. A grey view taken by Larry before the rains arrived once more. Soon afterwards, looming out of the mist in front of us was Herrock Hill and I was a little concerned. 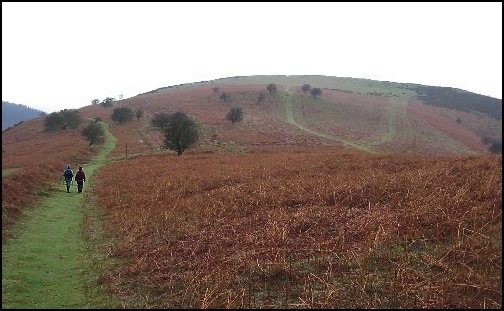 Having come of Rushock Hill we had lost a considerable amount of height and it looked as if it had to be regained. 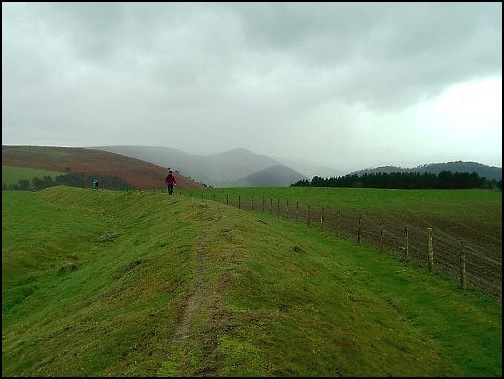 However, although the approach made it look as if another climb was on the menu the actual route was north, a very obvious downhill path that skirted the east side and then the north side of the hill. 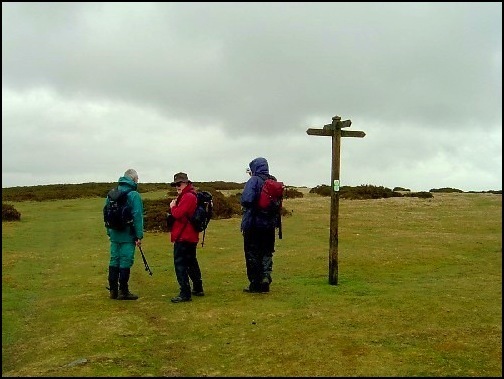 However, the constant rain had made the path slippy and so for the first time on the walk my walking poles were used to help reduce the likelihood of an undignified meeting with the ground. Herrock Hill- our path was actually to the right of the hill. 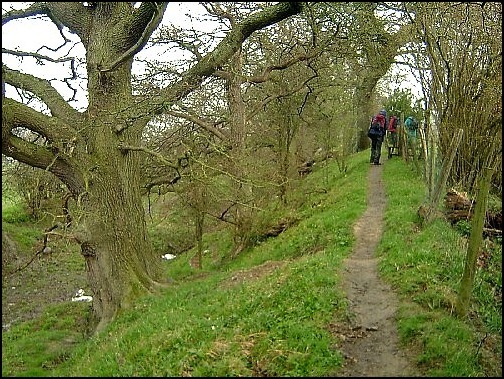 The path that descended to the east and north side of Herrock Hill. 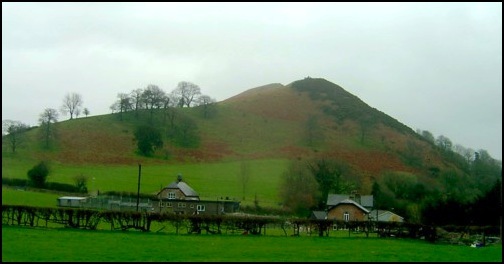 Having successfully got to the bottom of the hill we reached the B4362 and having turned right along it in a few metres we entered Powys. Mick and Larry - and it's raining again - we're reached Wales. We continued along the road and about a ¼ mile further on at Ditchyeld Bridge we took a lane on the left and at the first footpath on the right we ascended once more. This third climb was very easy compared with the previous two and although, having crossed a narrow lane, it was still uphill it was easy and interesting walking. After the lane the route went along a high embankment – another very obvious part of Offa’s Dyke - with a large ditch on the left and, although in parts in contained water, it was very reminiscent of the sort of sunken lanes that we have seen in the Cotswolds. It was also along this stretch of the walk that we had good views of the hills to the west of our route. Very shapely they looked even through the rain which had been more or less a constant drizzle since we had entered Powys. On the Dyke Again and a very obvious ditch and embankment. A little bit further on before leaving Offa’s Dyke and heading down a lane westwards to Evenjobb we passed some cows on our left. 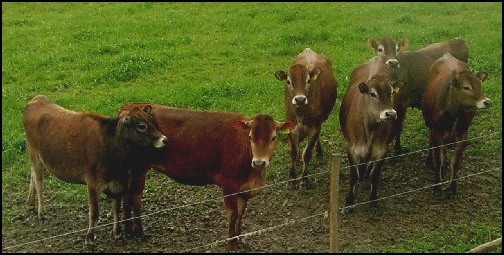 However, for once Larry did not seem frightened of them. Probably as he was separated from them by a well maintained barbed wire fence. Once on the lane, with high banks either side, it was only a few minutes before we reached Peter’s Car and a return trip to Gladestry and farewells to Peter before Larry and I headed home with Mick. Although the rain was never torrential, it had been a wet, but a very enjoyable, day. However on a day with better visibility it would be superb. Maybe we will make another visit sometime.